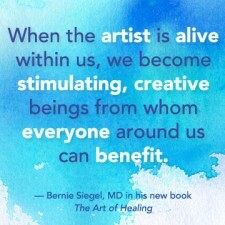 Q & A with Bernie – April 7, 2014 | Bernie Siegel M.D. I began reading your new book during my chemotherapy treatment today. WOW! It is very powerful! I found that I was highlighting something on nearly every page and re-reading many of the paragraphs. Bernie, it is another Love, Medicine, and Miracles and is very much needed! I have read all of your books. As I told you in an earlier e-mail, I bought 18 copies of Love, Medicine, and Miracles for volunteer counselors to use as their number one tool to help cancer patients who call the suicide and crisis hotline where I volunteered as a counselor eight hours a month for 13 years. I cannot tell you the number of times I have quoted to others, to save lives then and now, your words on page 43, “Far better to admit that the situation is grave, yet to remind the patient in truth that there is no ‘incurable’ disease from which someone has not recovered, even at the threshold of death.” This is my favorite non-Bible quote. I have also bought copies of your other books for myself, my parents, and others. I am sure that all of your books have touched many, many lives. This new one, though, touches my life. I can’t thank you enough for writing it. I have already begun telling others about it. God has blessed you as an inspirational guide. Thank you for all the marvelous good you put into our world. You are a talented performer who consistently “shows up for practice,” and it is a complete pleasure to be your life coach. It is inspirational to imagine, even for just a few moments, how many lives you have positively impacted. I hope each person reading this right now does just that—and realizes how much power each of us has to do good in the world if we make that a priority. 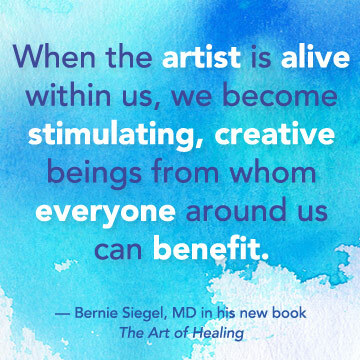 This entry was posted in Mind / Body Medicine, Q & A with Bernie, Stories and tagged life coach, Love Medicine and Miracles, The Art of Healing. Bookmark the permalink.